"There aren't a lot of great uses for leftover pickle juice. I did hear recently that some people like to drink this stuff after jogging, which I found to be quite shocking, since I had no idea people still jogged. Like most brined recipes, the payoff is in the texture and moisture content and not necessarily in the taste. Having said that, these did have a nice little twang. So the next time you have nothing left in the pickle jar but the juice, you now know what to do." Whisk pickle juice, brown sugar, kosher salt, 1 teaspoon black pepper, and 1 pinch cayenne pepper together in a large bowl until sugar dissolves. Submerge chicken breasts in brine, using a plate or bowl to sink the breasts into the brine; refrigerate for 1 to 2 hours. Remove chicken breasts from brine, discard the brine, and dry chicken breasts with paper towels. Brush each breast with olive oil and season each with salt, black pepper, and cayenne pepper. Cook chicken on the preheated grill until no longer pink in the center and the juices run clear, about 5 minutes per side. An instant-read thermometer inserted into the center should read at least 165 degrees F (74 degrees C). Transfer chicken to a plate, tent the plate with aluminum foil, and let chicken rest for 5 minutes. 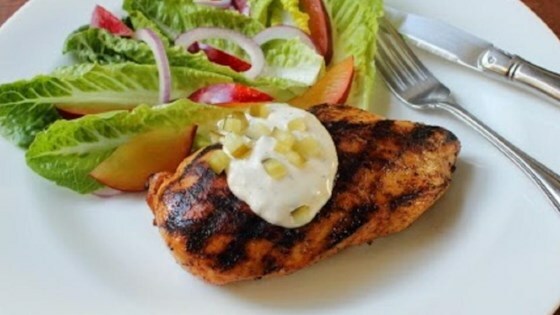 A pickle juice brine results in moist, delicious grilled chicken breasts. The nutrition data for this recipe includes the full amount of the brine ingredients. The actual amount of brine consumed will vary. I followed this recipe as directed. I could certainly taste the pickle juice, and not in a good way. Didn't find the chicken to be especially moist either. Wouldn't make it again. Surprisingly good flavor and a nice moist piece of chicken. I didn't change a thing and I don't know what I would. Since finding this recipe a month ago, I’ve made it four times! I love pickles. I marinate the chicken overnight, then oven roast them. Delish!